The staff all gathered on June 30 for a final luncheon in honor of our colleague of eight years, Joel Wind (that's Joel in the back row in the center). Joel served as the Society's Administrator a.k.a my right hand. He handled everything -- from bank deposits, to restoration projects and our Homeland Security grant. He saw and could do it all. Joel excelled at giving tours of the historic synagogue and I often received lovely thank you notes from visitors extolling Joel's tours. So it's with sadness that we say good bye to Joel as he retires from the Society. But we are happy to have Joel continue as an active member and part of the JHSGW family. Nearly forgot to write about the amazing experience I had at the first ever Jewish American Heritage Month (JAHM -- pronounced "JAM") reception hosted at the White House by President and Mrs. Obama. In the photo at right, I'm with Congresswoman Debbie Wasserman Schultz (4th from the left), the original cosponsor of the JAHM resolution. 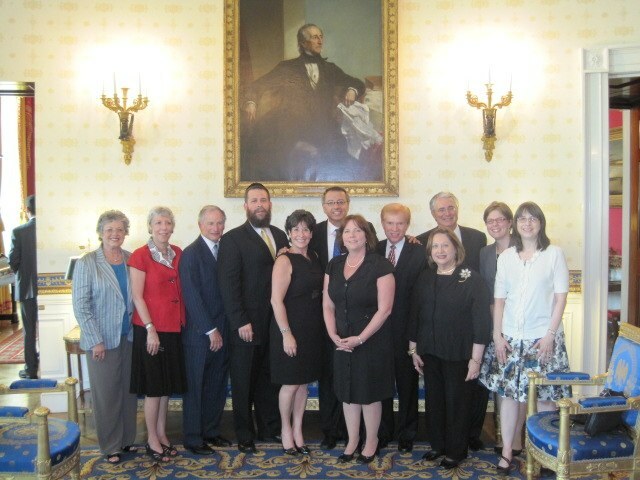 In the photo at left, I'm on the far right with the JAHM national steering committee in the Blue Room. A total thrill to be included among the smallish crowd-- I serve on the national steering committee for JAHM-- the only representative from a local Jewish museum or historical society. 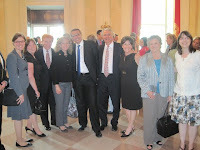 Since JAHM's inception four years ago, JHSGW has been at the forefront -- annually cosponsoring an event on Capitol Hill. Along with colleagues from across the country, we continue to plan activities to get the word out about JAHM and the contribution of our community to our country. Thrilling at this event to be in the same room as baseball great Sandy Koufax, baseketball great Dolph Schayes, TeaEO of Honest Tea Seth Goldman and even the CEO of Spanx not to mention the owners of Manischewitz.